It is difficult to see HYIP programs that have survived for more than 1-2 years and that is why I’m about to write about a program that has been running for an incredible 2384 days as at today called Apex Investment. Apex Investment started on 23rd Of July 2010 and was added to AlexNews on 22nd Of January 2017. This long term program has really surprised HYIP watchers as they have exceeded expectations and I am quite convinced that it has a lot more days to run because they have been consistent right from the beginning. But, is it really running from 2010? I’ve found the thread on talkgold.com which is saying that Apex Investment is started on 2010 but not found any HYIP monitor or other trusted source that can ensure that this program is running from 2010. There are many HYIP monitors running from more than 7 years, but I can’t see any data about Apex Investment on those monitors. Another matter is the PerfectMoney account number (U7771865). This account number is claimed for Apex Investment but not really exist today. On the other hand, there were no HYIP program with same url (apexinvestcenter.com) in scam list of any old HYIP monitors and this can be a strong evidence for Apex Investment that they’re running from 2010. 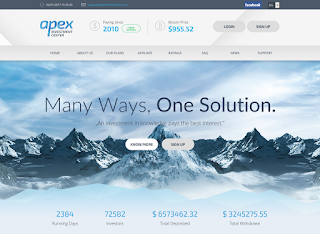 Apex Investment has a well designed website which looks attractive when compared to some other HYIP websites. The homepage is awesome which clearly shows and tells almost everything you need to know about the program. A professional video presentation is also present. Sad to say that there is no live chat or phone number is provided for instant help or discussing about any investment & lifetime related questions. By the way, all the links seem to be working even though some of them just give some skeletal information like the news and update link and the loading seem to take long. Apex Investment offers an investment plan that seems sustainable and the output depend on the amount you deposit. The plan offers 3% daily for 60 calendar days. Here the minimum deposit is $5 which means that you can start earning even with $5 which is little uncommon in long term HYIPs. 180% is the total profit where 80% is the net profit in this plan. This is an attractive plan for both small and big investors. Note that investors can transact using PerfectMoney, BitCoin or Payeer depending on the one that suits them most, you are at liberty to choose any. Like I mentioned earlier, the Apex Investment website is well designed and boast of DDos protection to keep all information safe and prevent DDos attacks. The website is hosted on a dedicated server with a guarantee of up to 99% uptime. Besides, you have a secured transaction powered by an Extended Validate SSL certificate which offers the highest level of trust and authentication. Finally, this program may started on 2010 or not, but I am almost sure that the admin of this program is in HYIP industry from many years. He has presented a surprising twist for us and he must be enough serious about this project. He has running a good advertising campaign and no doubt that Apex Investment is a big budget program. However, please don’t invest more than you afford to lose. Thanks for reading, if you have any questions or suggestions, don’t hesitate to contact me. DISCLAIMER: WE DO NOT OWN OR PROMOTE ANY PROGRAMS LISTED HERE. THE INFORMATION PROVIDED HERE IS FOR YOUR OWN USE. SOME PROGRAMS, INVESTMENTS OR ANY LISTINGS HERE MAY BE ILLEGAL DEPENDING ON YOUR OWN CONTRY'S LAWS. WE DO NOT RECOMMEND YOU SPEND WHAT YOU CANNOT AFFORD TO LOSE.